Second Blue Rose album by Chicago’s own, THE GREAT CRUSADES! You can’t overlook the „9“, proudly displayed on the inner sleeve of Until The Night Turned To Day, the new album by the Great Crusades. This powerful four-piece from Chicago has been delighting audiences in Europe for 20 years, racking up more than 20 cross-Atlantic journeys. The Great Crusades have established themselves as a thrilling live act but while that reputation is well-deserved, it overshadows their achievements as recording artists. They are rarely perceived as the intelligently rocking, versatile, insightful-lyric-writing band that they are. Just in time for their early-summer tour, the band drop their 9th album Until The Night Turned To Day. After many years on Glitterhouse, this is their second album for Blue Rose Records and an apt successor for the much-lauded Thieves Of Chicago from 2014. A dramatic piano opens the album on the bar rock waltz ‚If You Could Only See Me Now‘ while Brian Leach’s nervous lead guitar circles around the theme of „from Galway into the world“. The same band, a completely different feel: ‚Only Took A Minute To Say Good Night‘ is pitch perfect country rock with pedal steel, acoustic guitars and a singer-songwriter-type storyline. ‚Hey Hey (River Charles)‘ is a slowly-building five-plus minutes rocker that takes its sweet time getting to an irresistible chorus and hook line a la Cracker or The Pixies. The next song is another contrast: A slowly, beautifully melodious piano ballad duet with Katie Todd, reminding listeners of Randy Newman or 70s Elton John. It is followed by the vehemently rocking, curt ‚Little Crown‘, a biting commentary on the zeitgeist with Brian Krumm’s raspy vocals, great guitar work by Brian Leach and a driving rhythm section. Once in a heavy-rocking mode, the six-minute ‚King Of Altered States‘ ups the ante: various electric guitars and a dominant slide rock mercilessly while Krumm sings/screams in a way reminiscent of the Guess Who’s ‚American Woman‘. The lyrics sharply criticize the current US administration: „do you see what’s happening in the world, do you feel what’s happening in the rest of the world? He’s the king of the Altered States“. Like most new songs, the driving drama rocker ‚Prayer Furnace‘ and the riff-and-fuzz-guitar-driven, catchy ‚Thanks For Asking‘ sound like they are ideally suited for live performance. The Great Crusades bring their stylistic rollercoaster ride with the acoustic, folk-rocking ‚If I Changed My Mind‘ and the uptempo, sweaty hard blues of ‚Last Dying Wish‘, reminiscent of Captain Beefheart and Tom Waits, to a relaxed ending with the pedal-steel-drenched Americana ballad ‚Petrified‘ which seems drawn from similar terrain as the one mined by the Jayhawks, Son Volt or the Wallflowers. 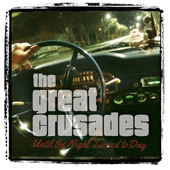 The album title hints at the Great Crusades‘ habit of nightly rehearsal jams that led to the ideas that were later perfected and turned into songs under Brian Leach’s auspices at at JoyRide studios. This seems a great method to keep the Great Crusades fresh, flexible and hard to predict – for that is exactly how they come across on Until The Night Turned To Day. Kommentare deaktiviert für Second Blue Rose album by Chicago’s own, THE GREAT CRUSADES!